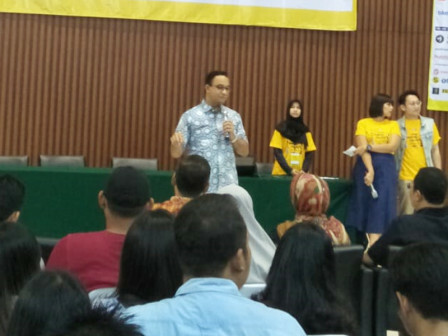 Jakarta Governor, Anies Baswedan attended on Universitas Indonesia (UI) Career and Scholarship Expo XXVI 2018 at Balairung UI, Depok, West Java, on Saturday (9/22).
" We hope youths who are competent, energetic, dynamic, and also hard worker could be a part in Jakarta Government"
Jakarta Government opens booth in this event for job applicants who want to be Jakarta CPNS. "We hope youths who are competent, energetic, dynamic, and also hard worker could be a part in Jakarta Government," he stated. In this chance, he also visited Jakarta Government booth. This event is held from Thursday (9/20) until Saturday (9/22). This event provides some information regarding Jakarta CPNS such as application procedures, requirements, and benefits.